The 18-page catalog incorporates both matte and gloss UV finishes, gold foil stamping, and an embossed 175th Anniversary logo on the cover. The Printing Industry Association of the South presented their 40th Annual Graphic Awards in Destin, Florida last month, celebrating the best printed pieces from Alabama, Arkansas, Kentucky, Louisiana, Mississippi, Tennessee, and West Virginia. 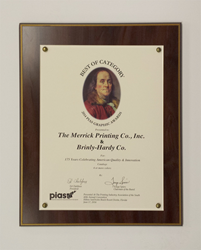 The 175th Anniversary brochure of Brinly-Hardy Co., submitted by Merrick Printing Co., was awarded Best of Category for Catalogs of 4 or more colors. The 18-page catalog incorporates both matte and gloss UV finishes, gold foil stamping, and an embossed 175th Anniversary logo on the cover. The piece also includes a gate-folded “timeline” insert printed on 100% post-consumer waste paper that follows the company’s history alongside snapshots of nostalgic US milestones. The contrast between the modern look of the gloss papers used for the majority of the catalog and the vintage feel of the felt paper used for the timeline insert reinforces this nostalgic theme. Tracing its roots back to 1839, the Brinly-Hardy Company has cultivated a rich history of developing lawn and garden products that are both highly innovative and extremely durable. The business is still family-owned, led by 5th generation CEO Jane Hardy. They pride themselves on being a leading supplier of high-quality American-made lawn and garden products for both consumer and commercial users.